Topics: Statement, Services, Packages, and Website Design. 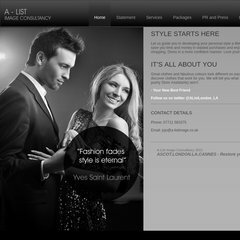 a-listimage.co.uk Services | A - LIST IMAGE CONSULTANCY - Style Makeover ..
a-listimage.co.uk Packages | A - LIST IMAGE CONSULTANCY - Style Makeover ..
a-listimage.co.uk Statement | A - LIST IMAGE CONSULTANCY - Style Makeover ..
a-listimage.co.uk Blog | A - LIST IMAGE CONSULTANCY - Style Makeover - Stylist ..
ns2.mainnameserver.com, and ns.mainnameserver.com are its DNS Nameservers. It is hosted by Heart Internet Ltd England, using Apache/2 web server. The programming language environment is PHP/5.2.17. PING www. (79.170.44.77) 56(84) bytes of data.